Depending on which wood planer you buy, a woodworking planer can be a great investment if you’re looking to expand your talents into woodworks. They’re valuable tools that many people tend to overlook because they don’t realize the importance that they play when it comes to creating finely finished and smooth wood pieces. You can use a wood planer as a carpenter, woodworker, furniture maker, and even as a hobby. The only issue is that if you have never owned one before, you’re going to want to make sure you choose one that is right for your own specific needs. 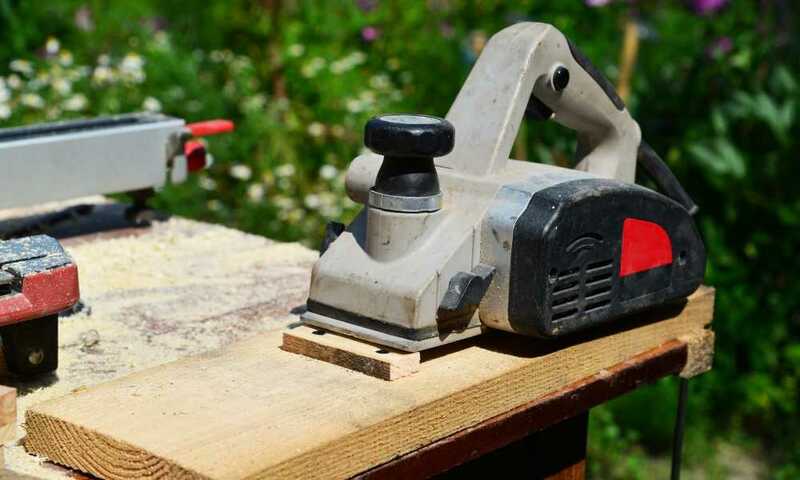 Wood planers aren't cheap, so we recommend that you research what type of wood planer is going to be best for the type of projects you want to complete and what type of wood you’re going to be working on. The Bosch PL1632 wood planer is designed to offer its users an industrial-built machine. It’s designed simply to be used on projects that don’t require a lot of strength. If you’re looking to cut thin- to medium-sized boards, then this will get the job done. To add to your comfort, the company has designed its handle to be optimally angled, which help allow you to move the unit with a forward motion with a softer grip. This product is perfect for anyone who plans to finish their wood projects or anyone who wants to slim down their wood boards to custom size. If you’ve ever tried to get custom-sized wood planks, especially if you’re doing a big project, then you’ll realize that many places won’t want to deal with the hassle of cutting the boards exactly to your liking. Many times you will find that even if they are willing to cut the board for you, you’re still going to end up with a wood slab that doesn’t have smooth edges and may even have splinters. So, if you’re working on a project that requires smooth wood, then a wood planer is exactly what you need. 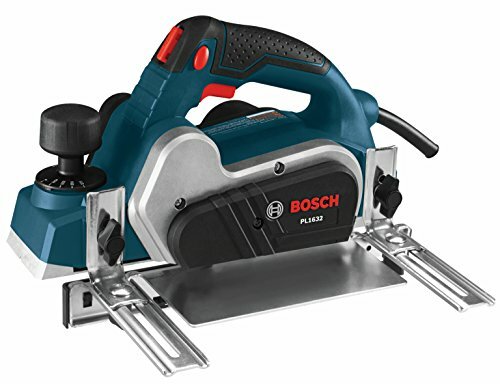 When you purchase the Bosch PL1632 wood planer, you will get the 3 ¼ inch wood planer which has a 6.5-amp motor. You will also receive a reversible wood razor blade, a dual mount guide fence, and a no-mar plastic overshoe fence. Included with the kit is also a blade wrench and a shaving bag. The PL1632 wood planer has a 6.5-amp motor which is industry grade and has a safety feature with a lock off-and-on button. This can help prevent any accidental startups and provides you with extended operation. The dual mounted fence can help give you non-flexing guidance and can help prevent marring of any doors or projects. The ball joint cord swivel allows you to easily position yourself without having the cord come in and block your way. It also includes a spring-loaded built-in stand which helps elevate it and protect the blades. The motor can run up to 16,500 RPM, which allows for fast removal. To use the wood planer, you will first need to clear your workspace and align the planer where you want to work. Make sure that there are no other objects in the way of the planer and make sure that you’re wearing a mask and safety goggles. The reason for this is because wood planers will usually send dust and particles flying in the air, and you don’t want to be breathing these in. Adjust the board onto your work surface and make sure it’s secured. Then you can turn the wood planer on and start to slowly push it against the areas you wish to smooth. If this wood planer does not have the specs that you need, you can also check out the DeWalt DW734 bench top planer. This planer is a little bit different from the Bosch, because instead of being a moveable piece of machinery, it functions as your work surface and as a wood planer. It has a powerful 15 Amp motor which can run up to 20,000 RPM and can cut woods that are stronger and thicker than normal. It has a three knife head cutter and can cut 96 cuts per inch. Reversible knives deliver 30% more life than other knives. It has a four-column carriage which can lock and also an extra long in-feed and out-feed table which gives you 33 inches of support. A wood planer can be the perfect addition to any handyman’s set of tools. If you’re into woodwork and you’re interested in learning how to create stunning furnished wood projects, then a wood planer is a great pick for you. They do not run cheap, so we highly suggest that you do your research on which wood planer will work for you, as you will have to buy a different wood planer depending on what type of wood you will be cutting and how thick the wood will be. The Bosch has a powerful motor that is perfect for beginners who just need simple work done.